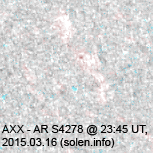 Last major update issued on March 17, 2015 at 05:00 UT. 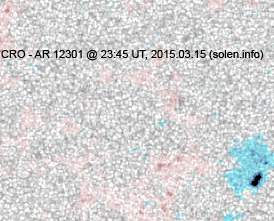 The geomagnetic field was quiet to unsettled on March 16. 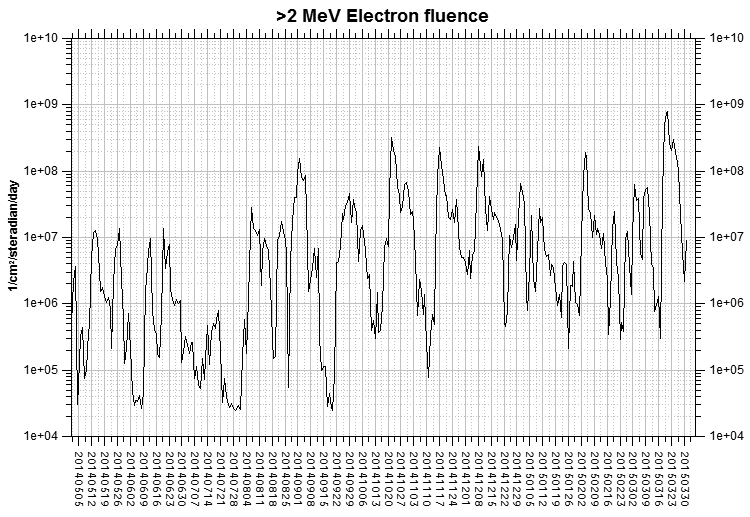 Solar wind speed at SOHO ranged between 341 and 440 km/s. 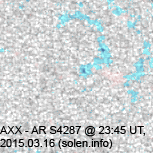 A disturbance related to a co-rotating interaction region began early in the day. 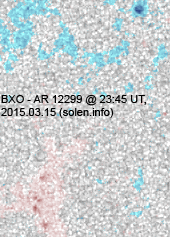 Solar flux at 20h UTC on 2.8 GHz was 117.2 (decreasing 1.3 over the last solar rotation). 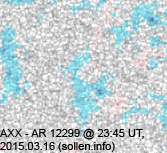 The 90 day 10.7 flux at 1 AU was 134.9. 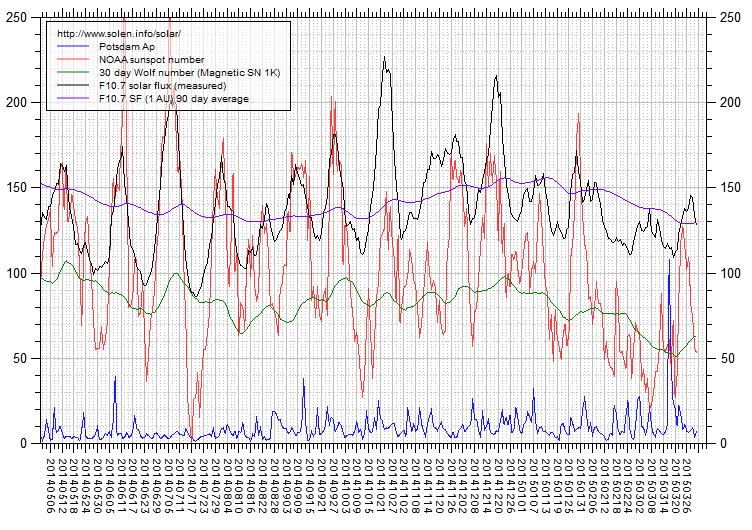 The Potsdam WDC planetary A index was 11 (STAR Ap - based on the mean of three hour interval ap indices: 10.6). 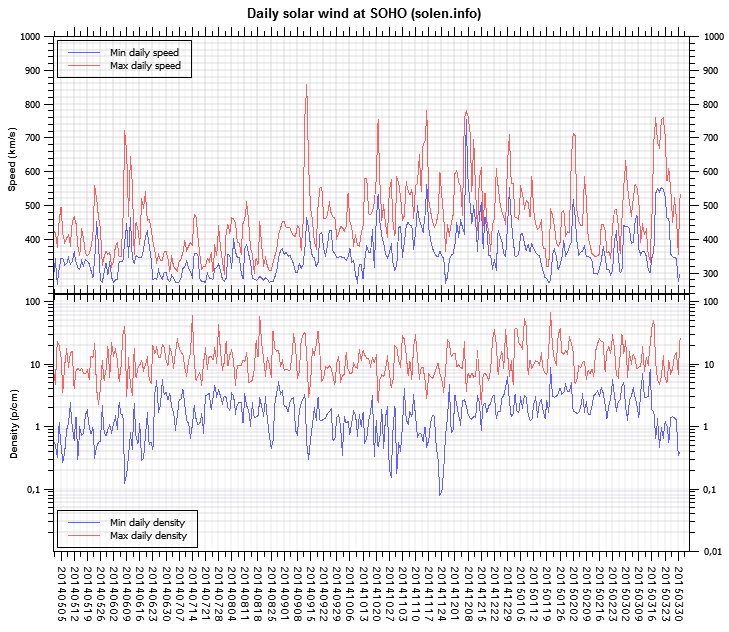 Three hour interval K indices: 23332310 (planetary), 23322321 (Boulder). At the time of counting spots (see image time), spots were observed in 10 active regions using 2K resolution (SN: 153) and 7 active regions using 1K resolution (SN: 96) SDO images on the visible solar disk. Region 12297 [S18W48] decayed slowly. 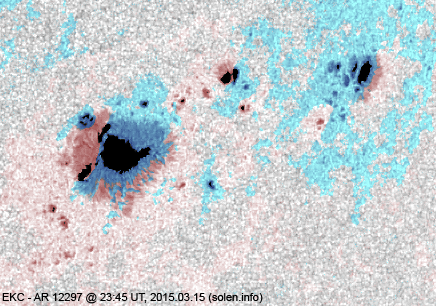 The largest penumbra still has a magnetic delta and could produce further M class flares. Region 12299 [S05E08] decayed slowly and quietly. Region 12301 [S17W26] decayed slowly and quietly. 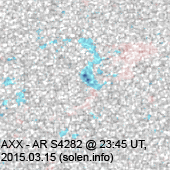 S4278 [N20W49] reemerged with a penumbra spot. 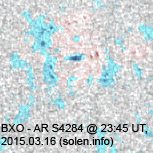 S4283 [S25W25] reemerged with a penumbra spot. S4284 [N10W38] developed slowly and quietly. 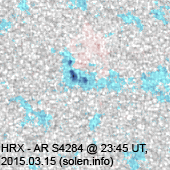 New region S4285 [N19E79] rotated into view with a single spot. 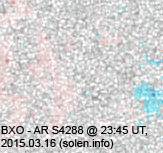 New region S4286 [N08W23] emerged with a penumbra spot. 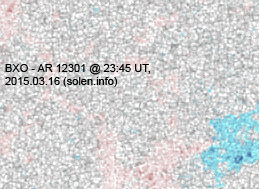 New region S4287 [N18W21] emerged with penumbra spots. 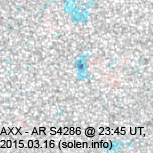 New region S4288 [S09W27] was observed with penumbra spots. 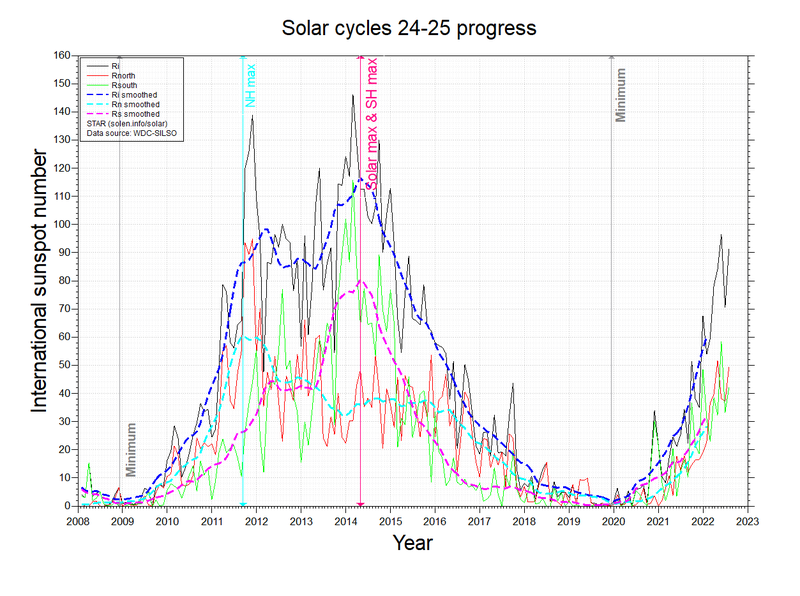 March 14, 16: No obviously Earth directed CMEs were observed. 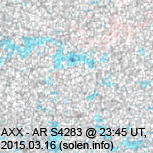 March 15: An asymmetric full halo CME was observed after the C9 LDE in and near AR 12297 early in the day. 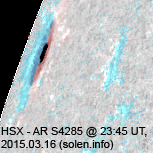 An extension (CH659) of the southern polar coronal hole rotated across the central meridian on March 14-16. 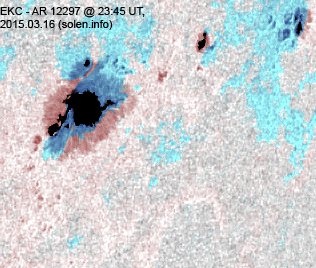 This, and a northern hemisphere coronal hole, could be associated with co-rotating interaction regions. 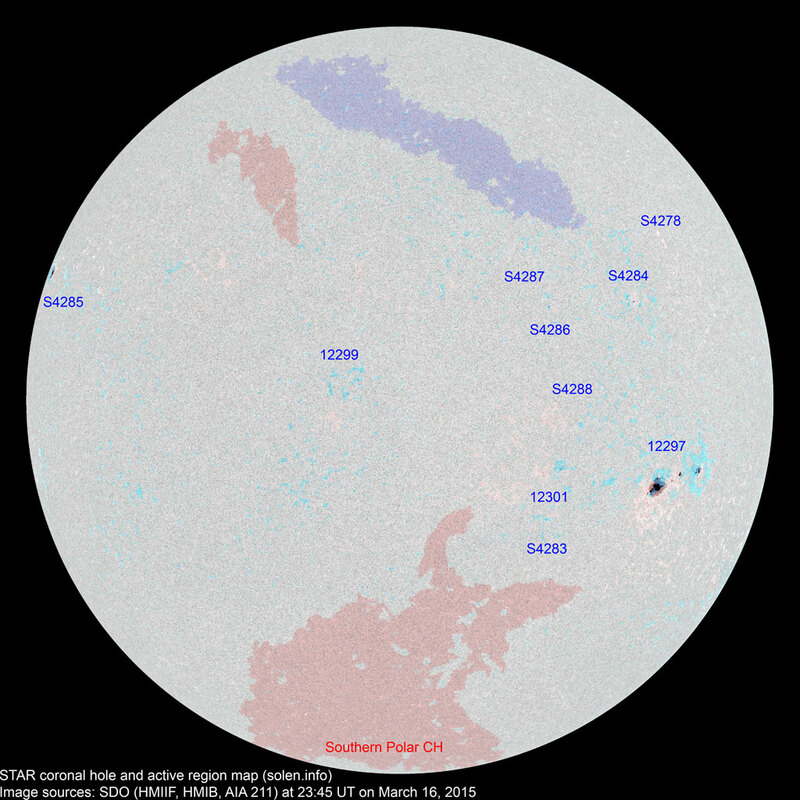 The geomagnetic field is expected to be quiet to minor storm conditions on March 17-18 due to effects from co-rotating interaction regions and CH659 and quiet to active on March 19. 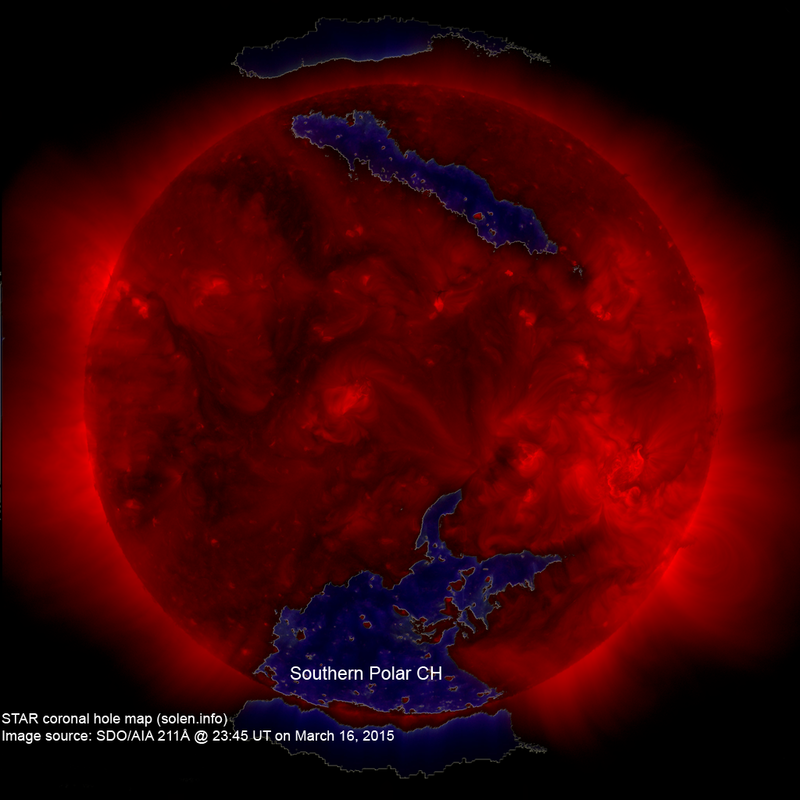 March 18 could see the arrival of the CME observed on March 15.